Memorial Day is right around the corner, and do you know what that means? You can "officially" wear white pants again. Okay, so you can technically wear them whenever you want, but the fact of the matter is a lot of people are too intimidated by white pants to wear them at all. Some consider them unflattering due to their stark color, some think they are too high-maintenance since they are prone to getting dirty—the list goes on and on. If you are one of those people put off by the idea of wearing this particular trouser style, we are about to change your opinion entirely. Use this summer holiday as a reason to give these pants a second chance. 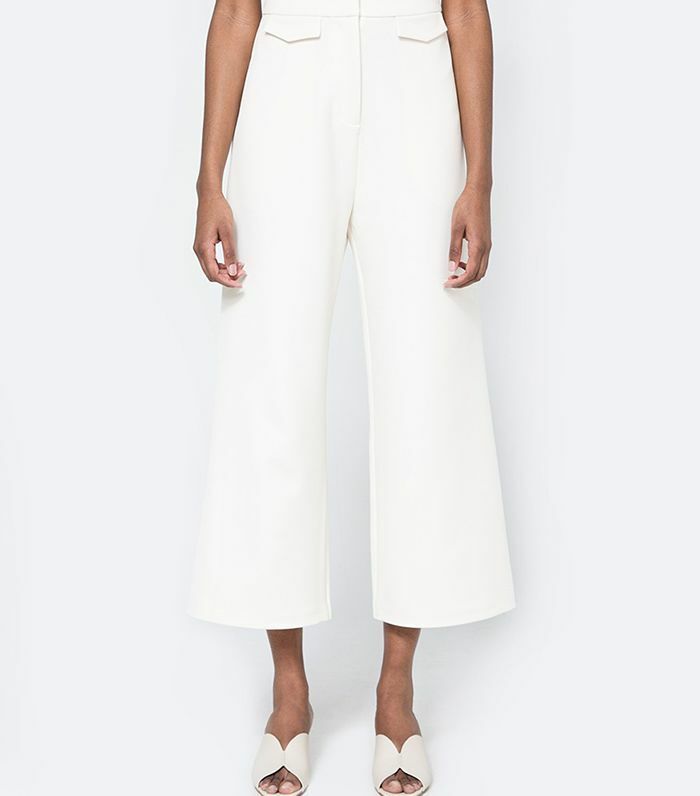 Ahead, we have shopped out the best white pants for you to wear after Memorial Day, including a plethora of styles ranging from jeans to culottes. White pants never did anything to you, so why not give them the grace they deserve by testing them out with a denim jacket and sneakers, silk camisole and lace-up heels, or even a head-to-toe-white ensemble? Whichever way you choose to style yours, we promise you won't regret trying out this once ignored pant trend. Go on to shop the best white pants to wear after Memorial Day. Those mini pockets are adorable. Sometimes, all you need is a little color. A circle zipper? Count us in. Sleek warm-weather work pants have never looked better. That shoe-and-pant combination is everything. Elevate your everyday office look. These pants will accentuate your waistline like no other. Going on vacation? We've got you covered. The lightweight pants you've been waiting all year to wear. Can't forget a good pair of denim. How could anyone resist those pleats? Let the ruffles do the talking. Wear these with your favorite gladiator sandals. Ruffles are clearly having a moment. Try these with white sneakers for a crisp look. Speaking of sneakers, Olivia Palermo's go-to pair is on sale and has the best reviews.